It's #occupyICEPHL Day three!! 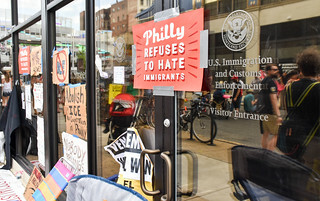 Despite Homeland Security federal police, Counter Terrorism units and Philadelphia police, we are STILL HERE occupying the ICE offices on 114 N 8th Street! Despite the arrests of 29 people and rain, the occupation continues. — Abolish ICE! Stop the deportations!